View More In Shore Power Adapters. 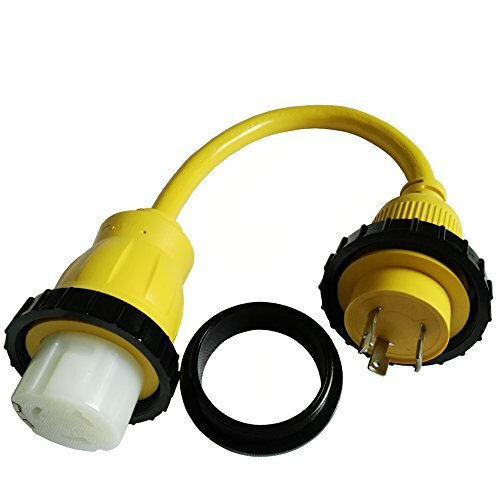 If you need to connect your 50A extension cord (with SS2-50 plug) into 30A power inlet (for L5-30 locking with seal ring type) to get power. This power adapter cord can help you to solve your requirement. You can get the cord or adapter in your need. We focus on producing power cord and molding NEMA plug or connector. Most of generally use NEMA plugs and receptacles we can manufacture with PVC cable. We have UL approved for all PVC wire in UL 62 standard, and also have UL or ETL approved for most of connectors in UL 817 standard. Please let us know your demand by send message to us. You can explain what plug with what receptacle and what length you want. Don't worry about the amount in your need, even you only need special one that you can not find it in retial. Waiting is the only thing we hope you can understanding. Because It will take several weeks for producing in factory, and the other 1~2 weeks for shipping from China to USA. Send your need to us by message now. Marine SS2-50 female connector with locking ring and seal ring. 100% copper wire conductor inside, Use 10 AWG copper inner wire, support max 30 Amp overload. Heavy-duty power adapter cord for Marine / Recreational Vehicle camping. If you have any questions about this product by Parkworld, contact us by completing and submitting the form below. If you are looking for a specif part number, please include it with your message.